She refers to the article, Increased Affluence Explains the Emergence of Ascetic Wisdoms and Moralizing Religions, by Nicolas Baumard, Alexandre Hyafil, Ian Morris, and Pascal Boyer just published in Current Biology. I know two of the authors personally, and with another one we have communicated by e-mail. All of them are good people and excellent scientists, but I have both good and bad things to say about this article. Let’s start with the good news. What is novel about the study is that the authors advance several rival hypotheses and then bring in historical data to evaluate the relative merits of each. In most previous analyses of this kind, researchers have been limited to ‘static’ data. Such data provide us with a ‘snapshot’ of where different societies are (or were), but do not tell us where they came from, or what happened to them after the snapshot was taken. The highly productive anthropological databases, George Murdock’s Ethnographic Atlas and the Standard Cross-Cultural Sample, put together by Douglas White and George Murdoch, which provided data for literally hundreds (perhaps even thousands) of articles, are of this kind. They have been very useful, but not as useful as dynamical databases that trace the development of societies over time. Baumard and co-authors, instead, looked at the dynamics. They selected eight most advanced areas of antiquity, ranging from Mesopotamia to Mesoamerica, and looked at the time trajectories of several variables in each area. As I have explained in previous blogs (for example, here), moving from static to dynamic databases will allow us to test theories much more robustly. Because causes typically precede the effects, being able to resolve how things change with time is key to testing mechanisms of social evolution. So far so good. But now comes the criticism. Although I like where Baumard et al. are going, I am much more skeptical of their first steps. I’ll try to make my critique constructive, because I share the goals of the authors. However, getting where we want will require much more work. First, let’s think of what Baumard et al. want to explain. It’s the rise of World Religions during the Axial Age (which most scholars date 800–200 BC, although these authors narrow it down to 500–300 BC). Baumard et al. select three Axial developments: Greece (e.g., Stoicism, Skepticism), North India (e.g. Buddhism, Jainism), and North China (Confucianism, Daoism). They treat them as all-or-nothing developments, which simply doesn’t make sense. For example, they exclude Zoroastrianism from their list of Axial Religions. 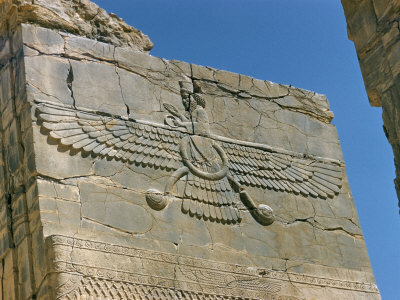 Yet, Zoroastrianism is arguably one of the first Monotheistic religions. Contrary to what these authors say, most scholars treat it as an Axial religion (and I agree with that). Baumard et al. also exclude Egypt from their list of Axial breakthroughs. That’s wrong, wrong. This is a big subject, so I’ll blog about it later. The problem with this binary, all-or-nothing approach is that it puts the actual history into a Procrustean bed. It seems to me that it would be much better to use a more nuanced approach – gathering data on different aspects of the Axial breakthroughs separately. This is the approach that we have adopted in our Seshat database. We score separately such things as morally concerned supernatural beings, monotheism, concern for equity and against oppression, etc. The Axial transition was really a multidimensional development, and it wasn’t concentrated within 200 years in just three locations. By abandoning binary, black-and-white characterizations we achieve a richer dataset that will allow us to test various theories much better. I also must take issue with the explanatory variables that Baumard et al. used. Their algorithm for calculating the main one, energy capture per capita, is never clearly explained (and I delved into the Supporting Materials to check it). I much admire Ian Morris’s vision and pioneering spirit, but as he himself admits in numerous places in The Measure of Civilization, his estimates are very tentative. And while the overall trajectory that he traces from the Mesolithic to the present day is largely correct, the details during the Iron Age (which is the period relevant to the Axial Age developments) are much shakier than the article in Current Biology portrays. In fact, I think that the picture will change quite a lot as we refine these estimates. So I wouldn’t yet jump to the conclusion that it was really affluence that resulted in the rise of World Religions. In Part II I will continue with my critical comments, as well as suggestions as to how we can (and will) improve on the Baumard et al. study. I can’t access it but whenever I see an article of any sort claiming an “exceptional uptake in affluence” during any historical period that predates the Industrial Revolution, I immediately become suspicious. Both because I have a general idea about the relevant data limitations and also for theoretical reasons. It seems that reverse reasoning is equally plausible. Does Affluence Lead to Asceticism or Does Asceticism Lead to Affluence? Or is there a third factor that leads both to affluence and morality? My first thought was that it’s not possible to practice asceticism, or religious abjuration of temptation more generally, until you have enough resources to have options you can turn down. If you’re at the edge of starvation or on the brink of elimination by rivals, you don’t have the option. So, I wonder if the question is not so much of affluence “causing” morality-based religion, as of poverty and insecurity preventing it? Well, There are two strategies for survival in an unpredictable environment: eat as much as possible in the “good” period (as well, sacrifice remains to The Gods of Fortune) and starving in a “bad” one, or to accumulate resources in a “good” period (which requires a lot of Asceticism) and redistribute them in a “bad” one (which requires a certain Morality). In long run, second strategy may lead to Affluence, but not first one. Thus, the need for rational (sustainable) management of common resources has led to the emergence of World (moralizing) Religions. There are some very serious problems with codings here. For one thing, Confucianism isn’t a religion, and wasn’t even remotely like one when it started; it was a school of statecraft. Second, the claim that these world religions were somehow more moral than whatever went before is VERY shaky. What do they mean by moral? All religions teach morality. I fear the coders here simply meant “morality like mine” rather than morality in general. For instance, these world religions largely got away from moral treatment of nature (treating animals and trees as persons needing respect, for instance). They also got away from the strong community ties of the older religions. One might also wonder if ascetism was some sort of moral advance; I’m 100% with Edward Gibbon on that–a guy working honestly for food and love is more good for society than a guy who’s in a monastery doing nothing and living off charity. My bias (and Gibbon’s was way stronger–he’s delightfully scathing), but a thought. The general point is: who are these scholars to determine what is “moral” in a religion? Why isn’t ritual a moral teaching moment, as Durkheim said? Well, Baumard et al. are not particularly clear about it, but the Axial religions (or ideologies) did several novel things. First, they preached that morality should be extended not only to co-ethnics, but to all co-religionists. In other words, the scale of cooperation increased. Second, these religions had a strong egalitarian component. See Bellah on that. Today’ major religions are moralizing religions that encourage material sacrifice for spiritual rewards. A key issue is whether moralizing religions gradually evolved over several millennia to enable cooperation among genetic strangers in the spiraling competition between increasingly large groups occupying Eurasia’s middle latitudes, or emerged only with the onset of the Axial Age, about 2500 years ago, as societal wealth increased to allow privileging long-term goals over immediate needs. Evidence does favor asceticism and moral deities to forestall free riding well before the Axial Age. Nevertheless, the power of moralizing scope to punish and reward, as well the scope of of selflessness and compassion, expanded greatly with the spread of universalizing religions along the long-range trading routes of middle Eurasia (“Silk Road”) linking the Atlantic to the Pacific via four large-scale empires that became contiguous around the time of Christ (Greco-Roman, Seleucid-Parthian, Bactrian-Kushan, Chinese). The universalizing and spreading of moralizing religions helped to mange problems of trust and control for ever increasing social interdependence and need for long-term economic planning among strangers. Sorry, Scott. I don’t think your hypothesis works. 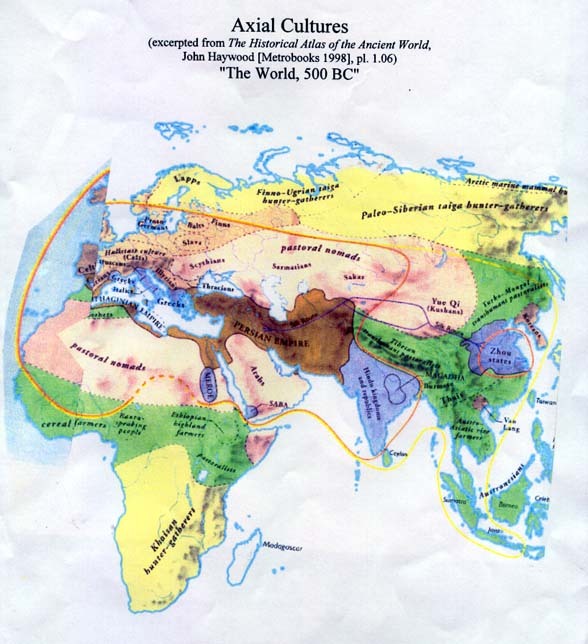 The formation of ancient Silk Roads _post-dates_ the Axial Age. So the causality is inversed. Peter, the Silk Road emerged pretty full blown in the 3rd century BC at the time of the Han Dynasty, at about the same time that the Hellenistic influence reached to the frontiers of China. The universal religions of moralizing Gods really started emerging then. Buddhism and Zoroastranism had earlier beginnings by about 3 centuries but fully salvational religions with moralizing kinds were not fully formed. My point is that only when the territorial empires became contiguous across Eurasia, with the Silk Road to tie them, did truly universal, salvational ideologies develop. That’s right, the Silk Road emerged after large-scale empires made travel safe. So it is an effect, not a cause. See Part II for more. Chiefdoms with moralizing Gods preceded the Axial Age by several thousands of years (and as you may hint in your commentary, Middle Kingdom Egypt of the late third millennium BC -ca 2100 – had clear moral injunctions and concern with afterlife, whereas early 2nd millennium – ca 1800 – Babylonian civilization, at the time of Hammurabi’s code, was very much concerned with moral justice). If anything, the Axial Age was really more an incubation period for universalizing religions, which did not spring full blown like Athena from the head of Zeus. Islam, for example, emerged nearly a thousand years after the Axial Age began. Upon close examination the Axial Age as usually thought of may not be all that special. And on a wholly different point: Although a society may fall back below the tipping point of caloric intake for asceticism, as Baumard et al. have determined it, but need not suffer absolute loss of ascetism because it had previously passed that point, it is nevertheless puzzling for their account why it is that poorest people and societies, as well as those on the frontlines of war, are by and large the most concerned with moralizing religion in today’s world – given that these are the people and societies most pressed to satisfy immediate needs. That’s right. Wealth can corrupt virtue, but I don’t see it creating it. In my theory, virtue was created in the crucible of extremely intense steppe frontier warfare. Morality creates trust, which allows credit for long term trade, investment and the production of wealth. This article reminds me of the thesis offered by Joseph Graeber in his book “Debt: the first 5.000 years”. Graeber analyzes the trascendental changes that are characteristic of the axial age in terms of the evolution of the nature of Money and Debt. However he does the opposite than Baumard et al: he expands the axial age from 800 bc to 600. He has a good reason to do that: 800 bc-600 was the age of coined money. Before and after reciprocity and personal “credit” were the base of all human economies. Graeber convincingly argues that the most defining feature of the axial age was the emergence of coined money: a qualitative leap in the nature of reciprocity and exchange. The emergence of coined money took place almost simultaneously in different places independently. At that same time moral religions also emerged in these same regions. They could correlated. Anthropologists have found out that before coined money all economies were mainly forms of reciprocity (direct and indirect). According to Graeber barter was almost inexistant: only applied to exchange with strangers or even enemies. Graeber thinks that coined money was an artifact made by the expansionist emerging empires which needed to pay for proffessional armies to conquer new lands and enslave great number of defeated people in order to work in mines and extract precious metals with which start the cycle again: the military–coinage–slave complex. Not by chance this is the time of philosophic dualism: idealism and materialism didn´t exist before. Since money is no longer the encarnation of prestige and trustworthyness people have to find those somewhere else. As a consequence moral religions emerge as a substitute for the personal-credit economies based on prestige and reciprocity. Increased affluence could be a consequence of the military–coinage–slave complex not the cause. I think Graeber´s explanation is a more ultimate explanation of the emergence of moral religions than Baumard´s; When group living and local economies were based on personal prestige, moral religions were not necessary: the usual norm enforcing institutions at the small-size group level could do the job. But when money becomes something “real”, impersonal and easily transferable, people in highly populated cities could feel somehow lost. May be they couldn´t understand why some virtuous and capable people fared badly whilst evil people were increasingly wealthy without anyone doing anything to stop it. Unlike human economies coined money facilitates economies of exploitation, and slavery (specially slavery by debt) is the purest form of exploitation. 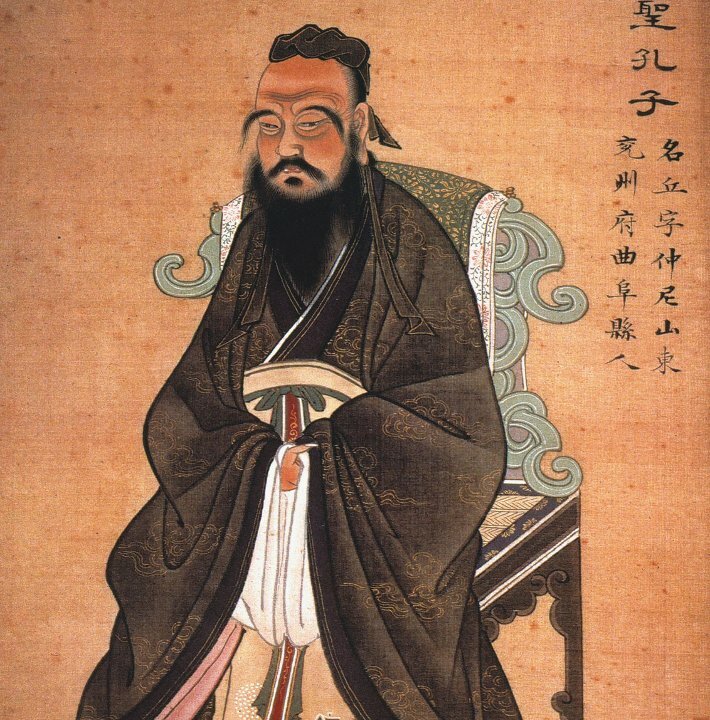 Confucianism is not a religion but is moral in the sense that it tries to restore virtue among the elites and avoid the most deletereous forms of elite exploitation. Other axial religions try to find confort in otherworldly rewards given by the ultimate alpha-male: the only one that deserves its position and will deliver justice in the form of punishment and rewards since the tribal group is no longer capable of doing that. Elites prefer the acquiescing forms of these religions where rewards and punishment will be delivered in the other life but there are also the social justice seeking variants (mesianism) that want punishment today which are leaded by young capable males that are artificially excluded from the upward social mobilily that you analyze so insightfully: the revolutionaries. It is a generalization indeed: Graeber´s book is 900-page and I am not that good summing it up. Anyway I thought you would appreciate the coincidence of axial religions and big scale economies based in state coinage where trustworthyness is somehow taken from the individual and transferred to the state responsible for the coinage. Axial states needed to pay proffessional soldiers salaries with a new kind of money that didn´t depend on the soldiers belonging to the social network of the city. The soldiers had to be loyal only to the state. Since commoners could pay their taxes with the coin that soldiers brought with them to buy staff the common people were willing to accept that coin and even use it for their exchanges with people outside their social network. A lot of moral consequences derive from the minimization of both direct and indirect reciprocity in every day economic life, and moral religions seem to fill the gap. Sometimes they seem to appease common people and make them accept the inequal social order (asceticism) and sometimes they do the opposite and claim a return to a more egalitarian form of life… a form of life that I in part identify with your asabiya. Perhaps expansionist states do need big comercial economies to sustain proffessional armies to perpetuate themselves, but eventually this non-egalitarian economies, that put more emphasis in mutualism and exploitation than in altruism, erode asabiya and therefore they could be sowing their own decadence.